In part 2 of the bodega construction process the floor is poured and the roof is on. If you want to refresh your memory with the purpose of this building and our strategy for building it, click here to read the blog post of Part 1. This is what we came back to after being in El Salvador for almost 3 weeks running retreats. We hadn’t planned to have the team keep working in our absence but they had been working so well, with everything going smoothly, and were eager to keep going, so we figured we’d let them. Even though we already knew that in this country you really need to watch everything happening because inevitably an issue will arise and local builders will solve it the local way, which may or may not be acceptable by our standards. Despite this, we went ahead and let them put the roof on and pour the concrete for the floor. We would learn again that you really should not have any work done when you aren’t there to oversee! While we were gone, our friend Ben had sent us a few photos of the progress. Everything looked good so we sent them a message to continue. Once we returned, on first inspection things looked good, but then looking closer we noticed a few issues. Our roof panels are structural pre-painted zinc in forrest green. We chose that material because we thought the green looked nice and would help the structure blend into the surrounding trees, plus it’s a great material for catching potable rain water. The panels are relatively affordable, durable, and 14 feet long. In order to support a 14ft long panel that will eventually include a rain gutter, you need an alfajia (the structural beam of wood) that is 5 varas = (1 vara is 33″) long. Unfortunately, our guys could not find 5 vara lengths of guanacaste in time. They didn’t want this little detail to hold up the progress so they used alfajias that were only 4.5 varas. This created the problem that the last foot of the roof panel was unsupported, plus there was nowhere to attach the rain gutters. If we had been there, we would have explained that this was a problem and we would rather delay in order to find the right lengths of wood. Oops! Multiple actions were discussed as to how to remedy the situation. Eventually, we decided we needed to get short pieces of guanacaste and use them to lengthen the alfajias. It was a long process (especially since there is now no power on the ridge and we had to rent a generator at a rate of about $20/day plus gas) unscrewing the roof panels, cutting the alfajia at an angle, cutting the extension at the same angle (with a non-electric hand saw), then nailing the pieces together, then screwing the roof panels back in. The dogs love the cool concrete floor! We were also short a few roof panels to complete the hip roof on the back part of the bodega, so had to go back to town to buy a couple more. Still to be done: finish the roof, install the metal doors, and paint! 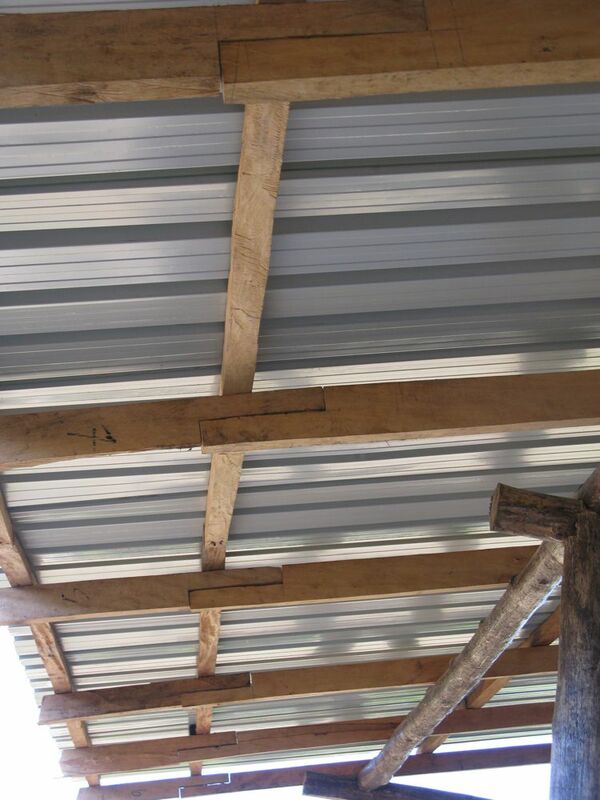 This entry was posted in Nicaragua, Tierra Del Sueno and tagged bodega, building, holly beck, kim obermeyer, land for sale, lots for sale, nicaragua, northern nicaragua, pre painted structural zinc, roof panels, tierra del sueno. Bookmark the permalink.